These Packages are available in all of our Florida Destinations. Please note, some locations may charge a fee for usage. All charges will be disclosed up front during the consulting stages. There will never be any hidden charges. Any of these Wedding Packages can be tailored to your specific desires with the addition of services available from our Special Touches. We've also dreamed up some exciting Florida Weddings, breathtaking sunset cruises, beautiful Forgotten Coast beaches, private homes in secluded tropical settings on the unspoiled Island Coast, and wonderfully romantic wedding/honeymoon resort packages. In addition, if choosing the Island Coast , we are proud to offer you the option of having your wedding ceremony and vows performed in English, Spanish or German! Larger bridal bouquet with choice of flowers and colors, with lapel to match. 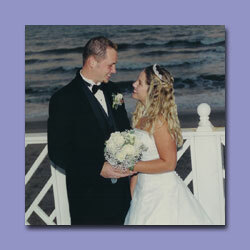 These Florida wedding packages are available in all our Florida Destinations. Some locations may have a site fee or location fee. Phone 866-522-0022, toll-free, to begin planning your special day. decorations, live music, cakes � please refer to the �Special Touches� page of my website.